I watched Dead Poet’s Society on a plane flying back home. I was given the DVD a long time ago but never felt “in the mood” for what looked a little like Hollywood’s interpretation of a self-help book. I’m not adverse to heart-warming films and in my life, I cry a lot. But the cover of the DVD looked too inspired and I just never felt like it. I didn’t think that the title was going to foreshadow what actually happens in the film. Whether through overuse or otherwise, it’s a name that rolls off the tongue smoothly and romantically. I feel like unless a movie is named so blatantly like “This is a Movie about Dogs and Cats and a Suburban Family living in Parramatta”, the melody that the movie title makes often adds to the mystique and sometimes austere tone even before the screen lights up. I kept watching up till there were twenty minutes left to the film and a pivotal conflict still hadn’t been resolved. Neil Perry was still being denied the right to be himself, by his father. It was around then I realised that this wasn’t the Disney movie that I had originally picked it out to be. The night scene in his family home played like a delusion which was perhaps fitting of the Midsummer’s Night Dream play. Old movies are like old people with dated nuances that we no longer understand, I fear the ominous and suspenseful violin the most. I expected Neil to wake up or for his father to have a wonderful epiphany and the next scene would be Neil on Broadway. Instead he died? We’re still here sitting on that question mark. The death was unexpected and I want to believe unnecessary but I couldn’t rationalise that statement either. I felt a bit silly for putting Dead Poet’s Society in a box reserved for warm fuzzy feelings all these years but my social circle had led me to believe otherwise. My brain that had preconditioned itself to assign the mood of happiness to ‘Carpe diem’ and ‘Oh captain, my captain’ needed time to reprocess this dark turn. People talk a lot about how death is either the antithesis of life or that it is an extension of it. Where does death fit in for me? I think of the writers I so admire, I think of myself, and I think we are the most brutal mass murderers who take lives for the purpose of ‘educating the reader’ or ‘plot development’. We create innocent people, clip their wings and know exactly which page and which line do they cease to exist. We weave such irreparable damage into characters because it is interesting. And death follows shortly after, walking hand-in-hand with writing because nothing is more profound than an end. Life is but a shadow, a poor player who struts and frets his hour upon stage and then is heard no more. It is a tale full of sound and fury, signifying nothing,” – Macbeth, Shakespeare. I cried. Not when Neil took his life or when his parents discovered it or when Todd vomited and ran into the snow after the fact. I cried at what turned out to be the happiest moments of the film. 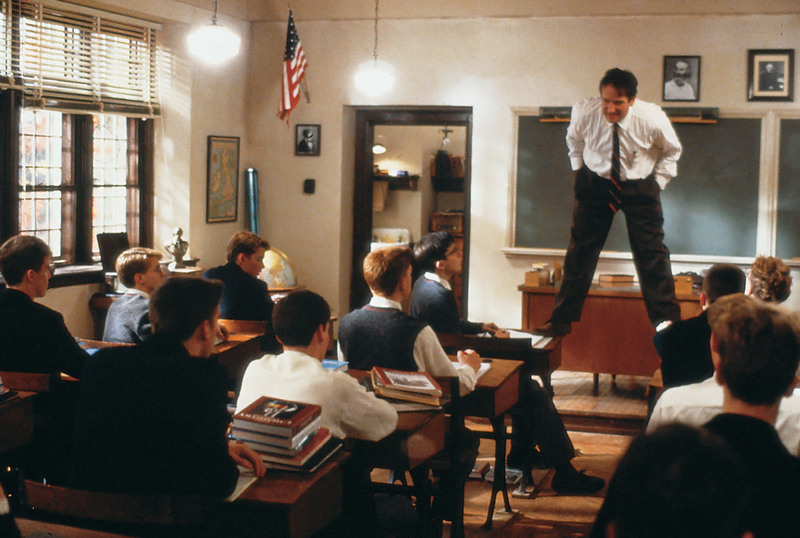 The parts which involved Mr Keating imparting life lessons to the boys, the bit where they raise him to the skies and the cover of my Dead Poet’s Society DVD. I cried because Robin Williams took his life earlier this year, creating such an eerie parallel between fact and fiction. Because perhaps ultimately his passion for film, acting and just generally being an awesome human being could not overcome the entrapment which befell his soul. Over twenty years after Neil Perry’s suicide, Genie you are also free. I went to the tiny shoe cupboard that is the Boeing 707 economy bathroom cubicle and saw that my make-up was smeared. I thought of Dead Poet’s Society and Robin Williams. I thought of Robin Williams’ daughter who is named Zelda. And I thought of you.